First, the book: Her Right Foot – written by Dave Eggers and illustrated by Shawn Harris. I expect that in early 2018, the cover will be adorned with a shiny gold award sticker, but buy it now while the view of the State of Liberty’s right foot is fully visible – as she steps into the sea. This is a timely book, to put it mildly. As the 24-hour news cycle causes stress and anxiety, Eggers’ book gave me a few minutes of pure joy. It is thought provoking and full of heart. Beginning with the story of the Statue’s origins (“After all, the Statue of Library is an immigrant, too.”), it continues to explore – with good humor and funny asides – the significance of the Statue’s right foot which is clearly taking a step forward. Truthfully, I had never noticed, but now I want to go back to Liberty Island and look again. Eggers’ book is full of fun facts about the iconic Statue. For example, did you know that the parts to construct the Statue of Liberty were put into 214 crates for its trip across the Atlantic Ocean? And I learned that what is now Liberty Island was once called Bedloe’s Island. Beyond the trivia, though, what stands out are the book’s final pages which I won’t spoil here. I’ll just say that reading them brings clarity to the conversation about immigration. Like the Statue of Liberty, baseball has a special place in the American story. This morning, in honor of the Jewish holidays, NPR’s Only A Game had a story on Hank Greenberg’s 1934 decision to be on the field on Rosh Hashanah – a game the Detroit Tigers won with Greenberg’s walk-off home run. Nine days later, on Yom Kippur, Greenberg sat out, and the Tigers lost. 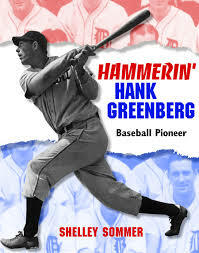 Listening to the segment about those eventful days in Detroit, brought back memories of writing my book, Hammerin Hank Greenberg: Baseball Pioneer, which was published in 2011. Greenberg’s decision was literally front-page news in Detroit, a city which was also the base for Father Charles Coughlin’s popular radio show which included anti-semitic rhetoric. It’s an amazing story, and one worth hearing if you don’t know it. Author visits are one of the highlights of working in a school library, and we were lucky to welcome the author and illustrator of a wonderful new book to Inly last week. Sherri Rinker and John Rocco, the author and illustrator of Big Machines: The Story of Virginia Lee Burton, told our 1st, 2nd and 3rd graders about the author behind the classic picture books, The Little House and Mike Mulligan and His Steam Shovel. The Little House is one of my favorite picture books so it is a special treat to have a tribute to “the little house” in our new library. A Virtual Summer Book Party! 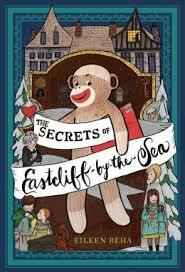 A book about a sock monkey named Throckmorton S. Monkey seals the deal. It will be added to our school library. 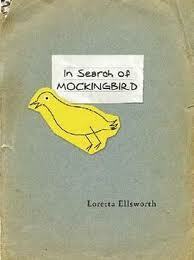 The next person in the chain was Loretta Ellsworth, the author of In Search of Mockingbird, the story of a young girl who goes in search of Harper Lee, her mother’s favorite author. I have recommended this book to middle school students after we read To Kill a Mockingbird. With all of the attention on Marja Mills’ book, The Mockingbird Next Door, about her real-life experience as Harper Lee’s neighbor, Loretta’s book might be fun to read right now. After Eileen and Loretta wrote, Mary Losure added her entry. I was especially excited to see Mary’s name because I read The Fairy Ring last year and put it on this summer’s school reading list. Mary’s book is the true story of two English girls who started a “fairy hoax” which fooled lots of people, including Sir Arthur Conan Doyle. 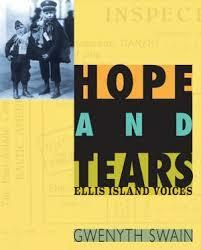 Next, the baton was passed to Gwenyth Swain, the author of Hopes and Tears: Ellis Island Voices. Inly has two copies of her extraordinary book about the immigrant experience. When our 4th, 5th and 6th grade groups begin their study of immigration, Swain’s is the first book I give to the teachers. My story is a bit different from the talented writers in this blog hop. I enjoyed writing the two biographies – I learned so much, worked with dedicated editors and was happy to send the stories of two inspiring figures out into the world. That being said, while working on both projects, I missed reading. I remember reading books about Hank Greenberg and enjoying them – but was also aware of my nightstand table filled with books I really wanted to read. I love to read and share my favorite books with others. I especially enjoy reviewing middle grade fiction for School Library Journal, writing my blog posts, and recommending books to kids and adults which, luckily, I have many opportunities to do. It was a special pleasure when Hammerin’ Hank Greenberg won a 2012 Sydney Taylor Honor Award from the Association of Jewish Libraries. Greenberg deserves more recognition for what he achieved both on and off the field, and the award ensured that more kids would hear his story. But when that book was published – and I had a renewed sense of appreciation for the work that goes into good nonfiction for kids – I returned to reading and recommending. Both of my books came from a personal connection with the subjects. My first biography for young readers, John F. Kennedy: His Life and Legacy, was a direct result of my 15-year career at the John F. Kennedy Library and Museum in Boston. Because of my work there, I was already immersed in Kennedy’s life and the goal of my book was to share his inspiring story with young people. Hammerin’ Hank Greenberg: Baseball Pioneer, my second book, was a very different experience. While I knew a lot about President Kennedy and my goal was to share his story with young people, I knew very little (initially) about Hank Greenberg. But my son played a lot of baseball when he was young and, along with that, he read books about baseball. I began to notice the name Hank Greenberg in several of his books about famous players and soon discovered that Greenberg, a first baseman for the Detroit Tigers, had an amazing story which was not as well known as it should be. He was the first Jewish baseball star – in fact, he almost broke Babe Ruth’s home run record in 1938. After a visit to the National Baseball Hall of Fame in Cooperstown to learn more, I had my new subject. I like to spread out: colored note cards, lots of paper, post-it notes, books, and copies of old newspaper articles. My process reflects my hyper-organized approach to most of my work. 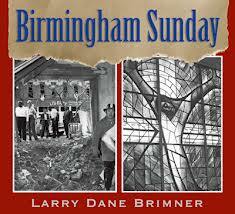 One of the best things about participating in this blog hop is the chance to introduce my readers to Larry Dane Brimner, the author of Birmingham Sunday and Black & White: The Confrontation Between Reverend Fred L. Shuttlesworth and Eugene “Bull” Connor. In her review of Birmingham Sunday (for Booklist) Hazel Rochman wrote: “This moving photo-essay covers much more than just an account of the Birmingham, Alabama, Baptist Church bombing that killed four young girls in 1963. The detailed text, illustrated with black-and-white photos on every spacious double-page spread, sets the shocking assassination of the children within a general overview of both the racist segregation of the times and the struggle against it….” When Inly’s middle school students study the Civil Rights Movement, Larry’s books are in the classroom. “Brimner’s comprehensive history of the United Farm Workers (UFW) begins not with Cesar Chavez but with the action of a group of Filipino farm workers who walked off the California fields in 1965. He combines the little-known story of the Filipino workers, a significant segment of migrant farm workers, with that of Chavez and the Hispanic workers, whose actions have received far more attention…He is objective about Chavez, providing both praise and criticism of his role as union and civil rights leader. One of the book’s strongest points is a discussion of how Hispanic organizers Chavez and Deloris Huerta and their Filipino counterpart Larry Itliong worked to overcome grower-exploited cultural differences between the two groups and persuade them to trust and work together. 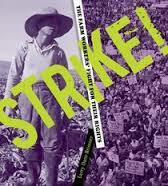 The text is supplemented with well-chosen primary source quotes, large period photos and political cartoons, and sidebars….Brimner’s inclusion of information about the Filipino workers who began the movement, quotes and balanced discussion of Chavez’s strengths and weaknesses provides a fresh perspective on the movement, making this book a first-purchase choice for middle-level researchers. Check Larry’s blog in the next few days where he will answer the same questions about his work. A note about the picture at the top of the post…. This is Jeff Koons’ piece – Split Rocker – which is half toy pony and half toy dinosaur! 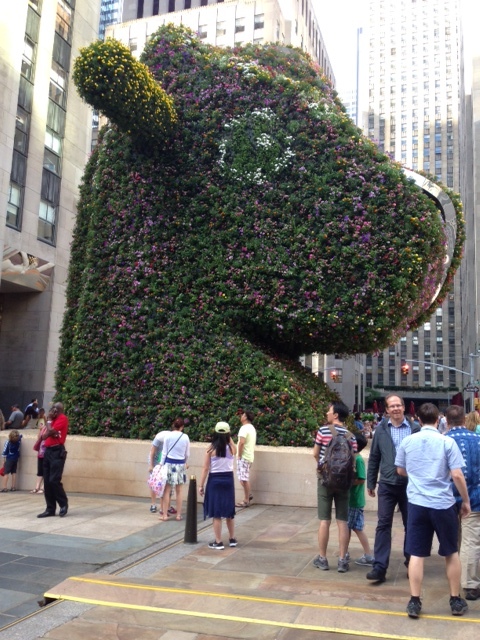 At over 37-feet-high and covered with flowers, it’s the festive centerpiece of Rockefeller Square this summer. There’s this bookstore with a great name and a well-known co-owner in Dedham, Massachusetts. The name of the store is the Blue Bunny, which is such a pleasant and cheery name that I knew it would be worth visiting. And then when I learned the store is owned by the Reynolds family – as in author/illustrator Peter Reynolds – it sealed the deal. Two colleagues and I traveled to Dedham yesterday, and we parked right in front of a coffee shop so the afternoon was set. As expected, it was worth the trip. We found wonderful books, enjoyed hot drinks and got lots of ideas for books to add to Inly’s Library. I loved the store, but when I looked at the books in the sports section and saw my biography of Hank Greenberg, it gave me a little thrill. In keeping with the season, the Blue Bunny also sold little pumpkins. 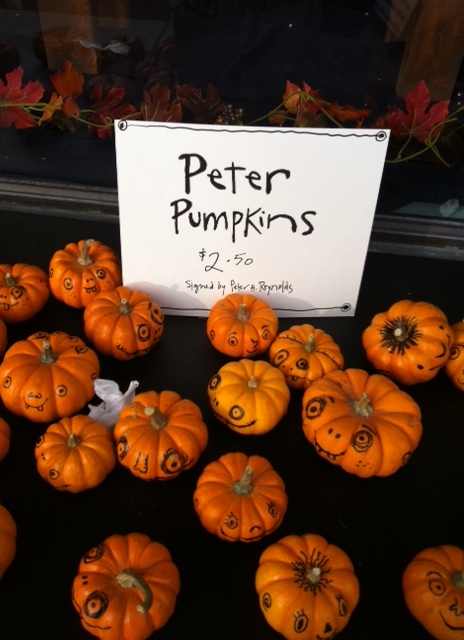 But not just any pumpkins… these were signed by Peter Reynolds, the author of The Dot, Ish and other creative and inspiring picture books. One book I was particularly excited about buying was Margie Preus’s new novel, Shadow on the Moon. I loved her novel about 19th century Japan, Heart of a Samurai. 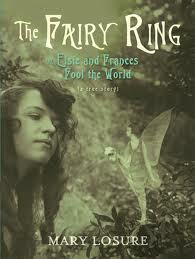 That book was a 2011 Newbery Honor book, and it’s one of my favorite all-time middle grade novels. I started Shadow on the Moon (about the courage of the Norwegian people during WWII) last night, and although I only read about 30 pages, I can’t wait to begin recommending it to to students. As it turns out, I may have lots of time to finish reading the book – as long as I have a flashlight. Hurricane Sandy is making its way toward Boston and, like everyone else, I’m wondering what the next 48 hours will bring. I was in the grocery store earlier today (buying peanut butter and crackers), and the store was as crowded as the day before Thanksgiving. I bought water, but I have no idea why. Everyone else was buying it so I went along, but I don’t remember ever losing water during a storm. 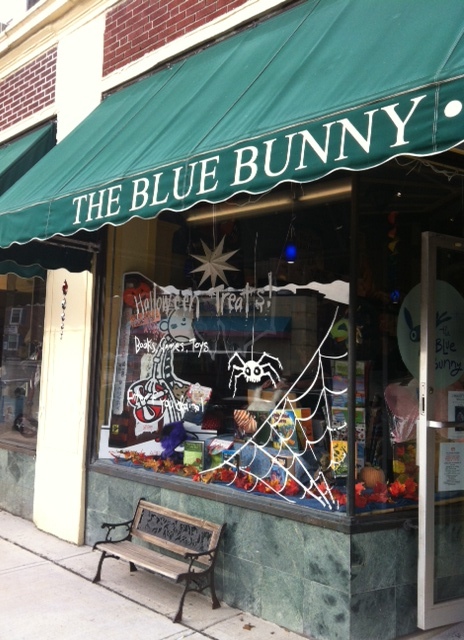 After Sandy passes, if you live within an hour’s drive of Dedham, Massachusetts, hop over to the Blue Bunny. It would be a wonderful place to begin your holiday shopping! I have three people on my mind today. 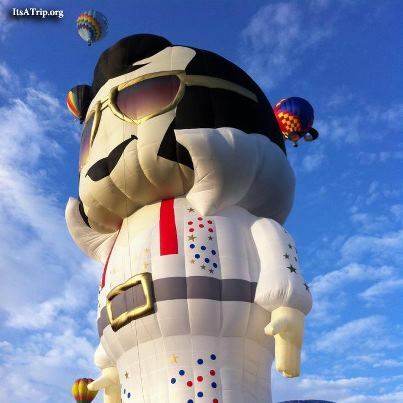 Two of them are well known historic figures – Elvis Presley and Hank Greenberg. And one – the Lunch Lady – is a character from a series of children’s books. 2. A friend of mine recently visited the Fenimore Art Museum in Cooperstown, New York. She texted this terrific picture to me – which I had seen years ago when I began my research on Hank Greenberg so it was much appreciated. 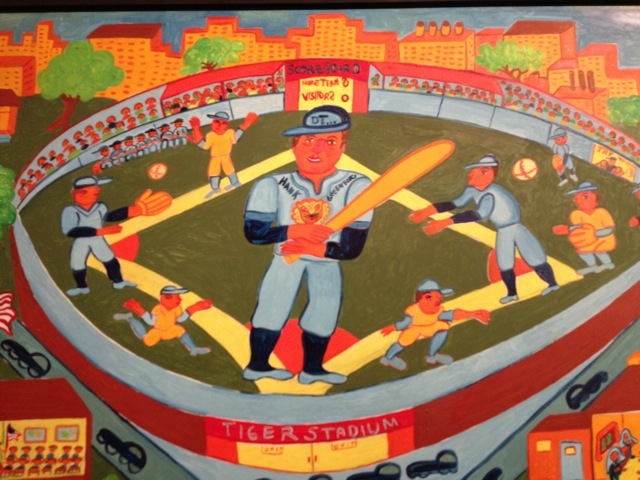 Homage to Hank Greenberg was painted in 1991 by Malcah Zeldis. The painting is autobiographical. Zeldis was remembering summer evenings at her childhood home in Detroit, Michigan. Her family spent summer evenings listening to radio broadcasts of Detroit Tigers games, and of course, the star of the team in the 1930s was Hank Greenberg. 3. The fictional character on my mind today is the Lunch Lady, the star of Jarrett Krosoczka’s popular series of graphic novels. Krosoczka is visiting Inly tomorrow – and the kids have been talking about it all day. 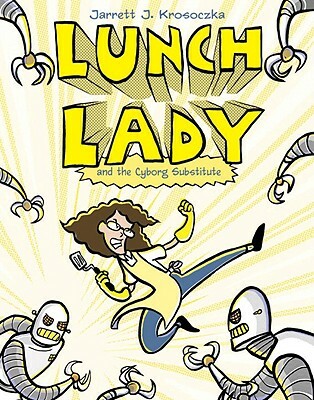 The Lunch Lady books have all of the elements of a successful elementary series: lots of action, funny characters, ridiculous situations, and lots of school-based humor, including a few jokes about the school library! I’ll have a chance to talk with Jarrett tomorrow and will write more about his visit. It doesn’t make sense that baseball, a sport that must appear in the dictionary under “summer” (along with ice cream and swimming) is no longer an Olympic sport. I know there is an effort to bring it back for the 2020 Games so maybe we’ll see a pitch being thrown in Madrid, Istanbul or Tokyo. Baseball was an Olympic sport during Hank Greenberg’s lifetime, but he was never an Olympic athlete. In 1940, a year he would have been the obvious first baseman for the American team, the games were cancelled because of WWII. Two nights ago I visited the Thayer Public Library in Braintree to talk about Hank as part of the library’s One Braintree, One Book baseball-themed program. Since you can’t watch baseball in London, it was nice to be with other fans of the game and talk about the days before there were night games! If you know a child who is cheering for Missy Franklin and the other American swimmers, you may want to check out John Feinstein’s latest mystery for middle grade readers: Rush for the Gold: Mystery at the Olympics. This installment of the popular sports-based mysteries features one of the young detectives, Susan Carol, swimming for gold in London. What my son always enjoyed most about Feinstein’s series is that the author uses “real” people in the books. For example, Bob Costas and Michael Phelps both appear in Rush for the Gold. I plan to order this for Inly’s Library because I’m guessing there may be a few new Olympic fans among our students! During the generous introduction of my book, I thought about how rewarding it is to see that Hank’s story has meaning for people. Several people told me that they heard about Hank Greenberg when they were children, and that they were happy to learn more about him. I wouldn’t suggest buying this book for your e-reader or even checking it out from the library. It’s the kind of thing you’re going to want to hold and keep. So, yesterday, I saw Pearlman standing there after the ceremony and it was one of those awe-struck moments – knowing that she had created all of the worlds in Binocular Vision with such compassion. When I went to say hello (and ask her to sign my book) she was warm and kind, and meeting her was a highlight of my travels in the world of books. It is a finalist for the 16th annual Boston Authors Club Award, an organization that held their first meeting in 1900! Hammerin’ Hank was also named to the Pennsylvania School Librarian’s Association’s YA Top 40 Non-fiction list. I’m grateful to both organizations, but most of all it makes me happy that recognizing my book puts Hank’s story into the hands of more kids!